Knots are everywhere in boating. They are used as a measurement of speed and as a way of securing nearly everything to the boat. Believe it or not, they are actually related. Knots, the kind tied in a line, were the first means of measuring boat speed. They were tied at regular spaces on a line, and the number of knots that played out behind the boat per hour measured speed. Knots on boats are the stuff of legend and pride. For centuries, sailors have sung the praises of their knots and knotting skills, and for good reason: knots are essential to boating skill and safety. Properly securing boats to docks, anchors, and mooring balls keep you safe at night. Using lines to trim sails keep you moving at maximum speed. Tying down objects on deck prevents them from washing overboard. 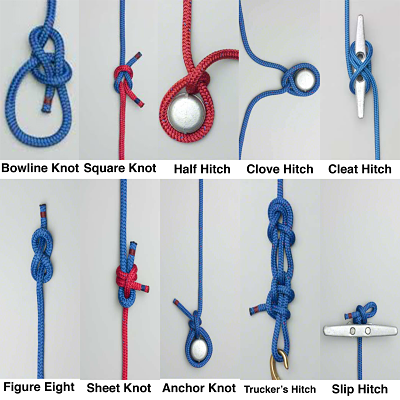 Here are ten useful boating knots to know. The mighty bowline is known as the “King of Knots.” It is the most commonly used knot in boating. The bowline creates a loop at the end of the line that cannot shrink or expand. Because it tightens when stressed, the more the line gets pulled, the tighter the knot becomes. Watch Captain Dave tie the King of Knots here. The square knot ties two lines together. It can be used to create longer lines, tie the boat to another line, or combine lines for some other function. Frequently used for reefing or furling sails, the square is another knot that tightens with stress, and is extremely reliable. Half hitch knots secure lines to a post or pole. Often two half hitches are used, creating a reliable hitch and helping sailors remember that a half hitch is actually only half of the knot. The clove hitch is commonly used to secure boats to docks that have a rail rather than cleats. The line wraps around itself without a real knot, making for a quick release when shoving off. Cousin to the clove hitch, the cleat hitch ties a line over itself on a cleat instead of a rail. This knot is used on boats and docks with cleats, and is one of the simpler methods of connecting the two. Learn to tie a cleat hitch with Captain Dave here. Also known as a Flemish knot, the figure eight creates a stopper at the end of a line. Its name says it all — in the shape of the figure eight, the knot, when tightened, provides a secure endpoint to any line. Figure eights are often used to ensure that a line does not run out of a pulley or other tackle on board. The sheet bend knot joins together two lines of different sizes or materials. The larger line is the bight (the curved, slack portion), and the smaller line loops through it. The sheet bend can also be used for lines of equal size, and is preferred to a square knot by some because it is less likely to jam and become difficult to untie. One thing you almost never want to become untied is your anchor. The self-explanatory anchor bend assures this. It consists of two half hitches plus two wraps around the object. It tightens fiercely when under load, and usually has to be cut off rather than untied (if that ever becomes necessary). The rolling hitch ties an additional line to an existing one, acting as another leg. The new line is tied in the middle of an existing, taut one. When rafting boats together, a line is often used as a kind of provisional dock rail, and the rolling hitch is used to secure the boat to the rail or line. While you might not think this is a boating knot, it is. The trucker’s hitch is used to secure loads on deck (or on a truck, hence the name). An example is tying a dingy down while underway. The standing end is tied with a bowline; the line is lashed over the object, tightened with a trucker's hitch, and finished with a half hitch and finally a quick-release half hitch. A slip hitch is a knot that will slide (or slip) along the line to tighten or loosen as needed. It is one of the easiest lines to tie and untie. This is a common knot used to attach fenders to rails. Because it is easily untied, it is not commonly used to secure things for long periods of time or when the line is likely to be under severe stress. Captain Dave shows how to tie a slip hitch in this video. Learn these ten knots and you will be set for the rest of your boating life. Use them frequently and you will dazzle your fellow boaters with your knotting skills!